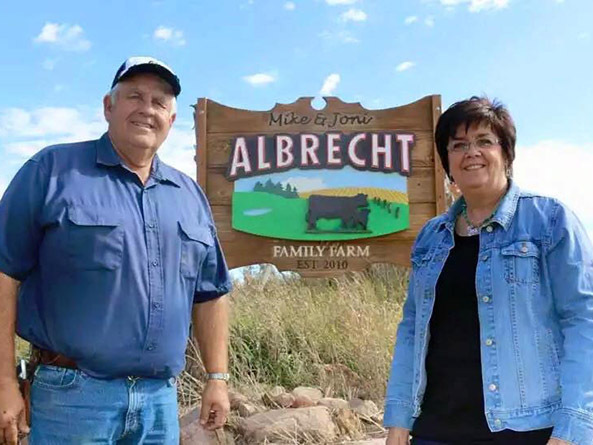 Above: Sen. Joni Albrecht and her husband Mike grow soybeans and operate a cow/calf operation and small feedlot on their family farm in Thurston County. It can never be said that Sen. Joni Albrecht is afraid to take a risk. In fact, she has built a career on following her instincts and exceeding people’s expectations. She was born and raised in Papillion, back when being from Papillion meant you were from the countryside. Albrecht prides herself on having raised daughters Michaela and Cortney while working full-time and serving her community. She eventually overcame those first-day jitters, ultimately finding her voice in community service. Working on Donnie Brandt’s mayoral campaign in Papillion opened Albrecht’s eyes to endless opportunities to reinvest in her community. She eventually would hold Brandt’s city council seat, from 1998 to 2006. “I would spend the whole weekend reading so that I could make an informed decision on Tuesday night,” Albrecht said. She would go on to win election to the Sarpy County Board of Commissioners in 2006. Albrecht relished her role serving her community, but a gentle nudge from her father inspired her to place some focus back on herself. In an effort to help, her daughter created an online dating profile hoping to find a new partner that could make her mother happy and even handpicked three potential suitors for her mother. Little did she know, some enterprising sons in Thurston County also had decided it was time for their father, Mike, to jump back into the dating world after the death of his wife. When Mike proposed, it forced Albrecht to make an important decision: file for re-election or embark on a new adventure with this farmer in Thurston County. “I had people asking me left and right why I wasn’t putting in my name for re-election,” she said. Albrecht would decide to take a step back from public life and the couple married in 2010. She not only gained a husband, but four adult children: Gregory, Laura, Scott and Andrea. Together they have 10 grandchildren under age 8. The transition to life in a small farm community came naturally, she says. In fact, it reminded her of home. She was enjoying life on the farm, but last year Albrecht felt that familiar itch to once again get involved in her community. It really was a calling to service for her, she said, to run for the Legislature. As she navigates her first year at the Capitol, Albrecht is focused on providing a strong voice for farming and ranching families in Nebraska. She said she never wants to lose sight of the issues affecting her constituents each day.